If you’re serious about wanting to reduce carbon pollution, you should stop breathing. Take a deep breath. Don't worry, that has nothing to do with climate change. A human exhales about 1 kilogram of carbon dioxide a day. That sounds like a lot when you consider there are about 7 billion of us on the planet. But the carbon we breathe out doesn’t magically appear — it comes from the carbon-based things we eat. And as you may recall, plants need carbon dioxide to make their own food via photosynthesis. 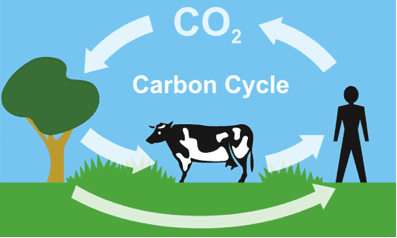 So, we have a closed cycle: the carbon taken in by plants becomes food for us (either directly or indirectly), and then we breathe the carbon out ... and then plants take it in again. When we burn dirty energy, we’re adding carbon to the air that had been out of the loop for millions of years and was stored underground as deposits of coal, oil, and gas. Once we take that carbon out of the ground, it will be in our atmosphere for thousands of years to come. The very first time you learned about carbon dioxide was probably in grade school: We breathe in oxygen and breathe out carbon dioxide. Any eight-year-old can rattle off this fact. It should come as no surprise that when confronted with the challenge of reducing our carbon emissions from the burning of fossil fuels, some people angrily proclaim, "Why should we bother? Even breathing out creates carbon emissions!" This statement fails to take into account the other half of the carbon cycle. As you also learned in grade school, plants are the opposite to animals in this respect: Through photosynthesis, they take in carbon dioxide and release oxygen, in a chemical equation opposite to the one above. (They also perform some respiration, because they need to eat as well, but it is outweighed by the photosynthesis.) The carbon they collect from the CO2 in the air forms their tissues — roots, stems, leaves, and fruit. These tissues form the base of the food chain, as they are eaten by animals, which are eaten by other animals, and so on. As humans, we are part of this food chain. All the carbon in our body comes either directly or indirectly from plants, which took it out of the air only recently.